OSLO, Norway — (BUSINESS WIRE) — November 12, 2014 — Cxense has introduced an eye-catching 3D advertising capability to help publishers and advertisers capture consumers’ attention and combat ‘banner blindness.’ This unique means for creating and displaying online content offers differentiation for premium advertisers and e-commerce sites. Viewing products in 3D – without needing any special glasses or equipment – will enhance consumers’ shopping experience and drive engagement. Faced with a plethora of online ads, many consumers have developed ‘banner blindness,’ with lots of consumers admitting they largely ignore online display ads or find them irrelevant. The resulting challenge for publishers and advertisers is to find ad formats that engage viewers without disrupting the user experience. Cxense’s 3D ads enable products and images to rotate and ‘pop’ off the screen, without annoying flashing, expanding or unwanted sound effects. It is a subtle yet distinct way to capture reader interest (using any type of device). Displaying three-dimensional ads adds a premium feel to sites, and showcases the brands using this unique format. 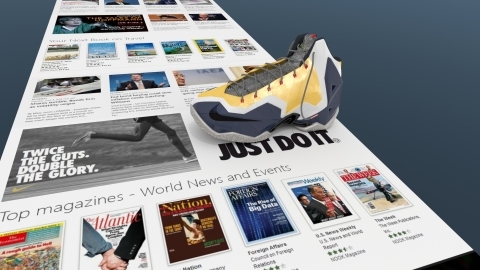 Although 3D advertising is a new concept, interest for the capability exists in the industry. In a recent survey Cxense conducted, more than three quarters (77%) of publishing executives expressed interest in displaying and selling 3Ds ads on their sites, as long as they don’t present a hassle for the publishers or their advertisers. The new 3D capability is available as part of Cxense’s advertising products, which are Software-as-a-Service (SaaS) solutions. Cxense offers industry-leading ad serving capabilities for display, rich media, video, and mobile advertising, alongside their analytics and data management capabilities. These tools enable publishers to target segments of users based on interest, intent, device, context and more. Cxense (OSE: CXENSE) helps businesses succeed in a digital world. Using audience data and advanced real-time analytics, Cxense creates hyper-relevant content recommendations, targeted advertising and predictive search that help increase digital revenue for publishers, and provide users with a better experience. By capitalizing on Big Data to match user preferences and create unprecedented personalization online, publishers gain more engaged and loyal readers, higher advertising revenue and increased digital subscribership. Cxense is a global company headquartered in Oslo, Norway, with offices worldwide. Customers include Dow Jones/Wall Street Journal, Polaris Media, Tamedia, AEON, Rakuten, Globo and many more. For more information: www.cxense.com,Twitter: @Cxense.